The girls’ soccer team had a great opening as the squad posted victories over Warren Tech and Belvidere. The Knights began the season in impressive fashion, topping Warren Tech 8-0 on September 4. Leading the way was Isabella Deo ‘20 with two goals. Hayley Goldin ‘19 had three assists and Eve Ryan ‘19 and Catelyn Woelfle ’19 each recorded a goal and an assist. Gill had a tough matchup in its following game on September 7, facing a Belvidere team that had also just come off an 8-0 victory. The Knights came out victorious, however, topping Belvidere 3-1. It was the first time that Gill has won at Belvidere since 2012. 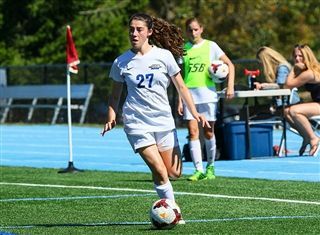 Goldin continued her impressive play, scoring two goals and adding an assist to help lead Gill to victory. "We have had some strong wins to start the season,” said head coach Mike Williams. “We have looked organized at the back and we have looked very dangerous in attack so I have been very pleased." With their 2-0 start to the season, the Knights currently sit atop the Skyland Conference Mountain Division standings. The boys’ soccer team had one of its toughest opening weeks in recent memory. 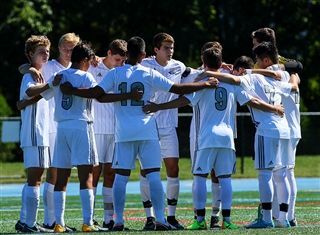 After moving up a division in the Skyland Conference, the Knights are now facing larger schools with great soccer programs. Despite the new competition, Gill has had strong showings to begin the 2018 season. The Knights opened up the season with a 1-1, double-overtime draw to North Hunterdon on September 4. Jordan Canica ‘21 launched an impressive shot to score the lone goal for Gill and Micaah Garnette ’21 provided the assist. Goalkeepers Mitch Fishbein ’19 and Alex Borto ‘22 each recorded six saves to preserve the tie. The Knights fell 2-0 to powerhouse Pingry 2-0 on September 8. Big Blue entered the match ranked 15th in the state and was able to hold the Knights scoreless on the day. Borto recorded seven saves in the loss. Despite opening up the season without a win, head coach Tony Bednarsky remains optimistic from what he sees from his squad. The girls’ tennis team opened up the season in strong fashion, posting a 5-0 win over Hunterdon Central on September 5. The Knights kept the momentum going in their match against Pingry on September 7. It was a back-and-forth battle between the two squads, with Gill able to pull out a 3-2 victory over Big Blue. Leading the way was Mayjah Jean-Pierre ‘21 as she easily won first singles 6-1, 6-1. Also claiming victories were Michaela Kroon ‘22, prevailing in a hard-fought match up for third singles, and the first-doubles team of Andree Aloise '19 and Tori Goldin '20. Stay tuned for coverage of Boys' and Girls' Cross Country as the results are posted later this week from the Newark Invitational.